Another addition to the Torsion line of optical projection balances is the one pictured on the left—the PL-800. Covering the range of 0 to 800 grams with an accuracy of ±0.01 grams, a precision (standard deviation) of ±0.005 grams, this balance, like the PL-1 and PL-2, features weighing by substitution for maximum convenience of operation. The optical range extends from 0 to 50 grams reading directly to 0.1 gram and by vernier to 0.01 gram. 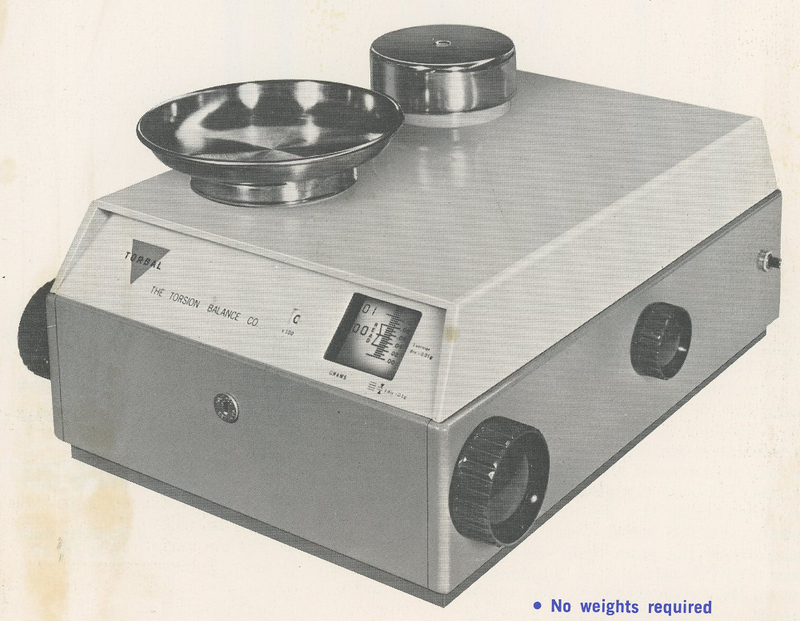 Weighings in excess of the optical range are easily accomplished by turning knobs, located at either side of the balance, to remove weights in 50 gram increments up to 750 grams. Smooth operation and long life are assured as the internal weight loading mechanism utilizes Delrin cams and nylon cam followers. Fast readings are provided by the silicone fluid dash pot which brings the optical scale to rest almost immediately. Direct taring to 40 grams can be effected by turning a dial at the side of the case. For additional taring, 100 grams can be placed on the back pan of the balance. The PL-800 operates on the Torsion principle, with conventional knife edges replaced by three strong, corrosion-and-fatigue resistant torsion bands supported by trusses. All bearings are eliminated. The balance remains unaffected by friction and wear, dust and dirt, severely corrosive atmospheres. A Torsion exclusive—the PL-800 does not have to be rezeroed each time it is moved. Even when out of level, it continues to project accurate weight readings. The balance is supplied with a 6-inch diameter stainless steel commodity holder. Overall dimensions are 12 5/8 x 16 1/2 x 7 1/2 inches high.